Each month our Design Team is challenged to take the items in the Monthly Club Q Kit and completely redesign it for your viewing pleasure. Stacy (owner/Club Q designer) does an amazing job with these kits already, and provides all Club Q members with color photos and directions. Now you have even more options of what to create with your goodies. Not a Club Q Member yet. Join before Aug 15th to get this month's kit. Get more details here! Adora says - I love the color contrast in this kit, I thought it was perfect match for this picture of my daughter and grandson. The bright background makes the photo pop, and show the serenity and calmness of the moment. Description/tips/techniques: Julie says - Time to complete: 20 min. Difficulty Level: easy. I like to mat my photos on light cardstock when they are placed on dark pattern paper. I think this helps them to stand out a little more. I love to use premade borders in not so obvious places. Here I used the border pieces to the left of the photo. I also put a small strip below the alphabet and a small strip below the photo. Remember borders do not have to cover the whole bottom area of something. amazing inspiration, prizes & challenges!!! Great layouts! and the Pictures are priceless- way adorable!!! What fabulous layouts Adora and Julie. What an awesome kit! I love your layouts. Very pretty. this is a GREAT kit!!! I love your layout Julie, simply gorgeous!!! Both layouts are FAB-E-LOUS!!! Adora and Julie...you did such a beautiful job on them! 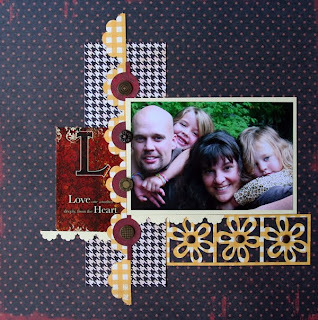 Love the ribbon idea Adora...and Julie, your border uses are a wonderful idea! Way to go girls!